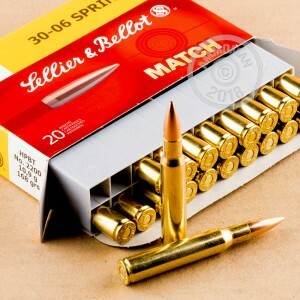 Be ready for deer season with 20 rounds of 30-06 Sellier & Bellot Match Grade ammo! The projectile featured in this product is a Sierra MatchKing hollow point boat tail design. This design makes trajectories flatter, leading to greater accuracy. As with regular hollow point bullets, the expansion you get with the HPBT bullet is large and deadly. When combined with a good shot, the boat tail adds a tad bit more accuracy because it has a tapered end, making it more aerodynamic. This is particularly noticed in long range shots. The brass casing of these cartridges will help to prevent your ammunition from corroding. Sellier & Bellot is one of the oldest European ammunition manufacturers. Since 1825, they have been producing high quality and dependable ammunition for the military, law enforcement and commercial markets around the globe. With their partner CBC, Sellier & Bellot produces over one billion cartridges per year.